(i) Fundamental basis of joint strategy. (ii) Interpretation of (i) into terms of immediate Military measures, including redistribution of forces. (iii) Allocation of joint forces to harmonise with (i). (iv) Long term programme based on (i) , including forces to be raised and equipped required for victory. Several of the War Department planners, working together, hurriedly prepared "notes" on the British message. unity of purpose. The possible movements involving U.S. Army forces fell under five main headings: (1) establishment of an air force based in Australia; (2) strengthening of other positions in the Pacific, especially in Hawaii; (3) reinforcement of British troops in the Middle East; (4) "acquisition" of positions in the South Atlantic--in northeastern Brazil, the Cape Verde Islands, or on the western or northwestern coast of Africa; and (5) relief of British garrisons in Northern Ireland and Iceland (and of the U.S. Marine provisional brigade on duty in Iceland). The Army was most certain of the immediate need to undertake movements under the first heading, and the President was most precise about the immediate need for movements under the last heading. The exchange of views indicated that the President and Chiefs of Staff were alike uncertain how to proceed with the discussion of strategy until they had had a chance to talk with their British opposites. As the conference was to show, much more clearly than had vet been shown--or could have been shown--the President and the Prime Minister as political leaders in some ways had more in common with each other than either had with his Chiefs of Staff. Likewise, the Chiefs of Staff--particularly those of the same service--might agree with one another more readily on what could be done than they could agree with the heads of their respective governments. The Army planners apparently expected that, after the preliminary British-American meetings, the scope of military conversations would he extended to include the representatives of Australia, China, and the Soviet Union.5 But the military conversations at ARACDIA--Unlike the political conversations, which led to the drafting and signing of the Declaration of the United Nations involved only the British and American staffs. In principle, the landings should be made by armoured and mechanised forces capable of disembarking not at ports but on beaches, either by landing-craft or from ocean-going ships specially adapted. The potential front of attack is thus made so wide that the German forces holding down these different countries cannot be strong enough at all points. An amphibious outfit must be prepared to enable these large-scale disembarkations to be made swiftly and surely. The vanguards of the various British and American expeditions should be marshalled by the spring of 1943 in Iceland, the British Isles, and, if possible, in French Morocco and Egypt. The main body would come direct across the ocean. The realisation of the victory programme of armaments; which first and foremost required the security of the main areas of war industry. The maintenance of essential communications. Closing and tightening the ring around Germany. Wearing down and undermining German resistance by air bombardment, blockade, subversive activities and propaganda. Maintaining only such positions in the Eastern theatre as will safeguard vital interests while we are concentrating on the defeat of Germany. The main object will be to strengthen this ring, and close the gaps in it, by sustaining the Russian front, by arming and supporting Turkey, by increasing our strength in the Middle East, and by gaining possession of the whole North African coast. forces required for an operation of such magnitude. "16 The Army planners were disposed to consider all other operations as strictly holding operations and to regard with disfavor any proposal to establish and maintain in a , "subsidiary" theater the favorable ratio of Allied to enemy forces that would be necessary in order to take the offensive there. The current British successes in Libya were merely the latest occasion for reviving the expectation that influential French leaders might "incite" an Allied occupation of North Africa, in anticipation of their being no longer bound or protected by the terms of the French-German armistice and their loyalty to the government at Vichy. The Prime Minister believed it essential to be ready to take advantage of this disposition, ill the hope of gaining Important military objectives at small cost. He hoped to seize the moment when the cost would be least--when French forces, released from their allegiance to any government in metropolitan France, might even help instead of opposing the operation--certainly much less than it would later become, when the Germans would have established political and military control over North Africa. In August 1941, during the staff talks that accompanied the conference of the President arid the Prime Minister aboard the Prince of Wales, the British staff had mentioned the project as one of the means by which early American intervention would "revolutionize" the military situation. The American planners, in commenting on this point ill late September, had advised the Joint Board that the United States did not then have "land forces adequate in strength and suitably equipped for operations in North Africa." They added that the success of such an operation as the United State might launch would depend largely on co-operation by French forces, and that Trench co-operation was too uncertain to plan on.21 This remained the American position till the time of the ARACDIA Conference. American planning during 1941 had provided for assembling an expeditionary force for possible use in the South Atlantic during the period after full mobilization. The most ambitious task contemplated for such a force in joint Board plans under development before 7 December was the taking of Dakar.22 More recently, the President had drawn special attention to this project.23 The War Department acted accordingly. ... difficulties of troop movement and logistical support by sea of the forces required. would in my opinion, make this a very hazardous operation at this time, in view of shipping shortages and the ability of German and (iceman-controlled ford's to arrive in that area much more rapidly than ours could. that would be required if that area becomes a theater of operations prior to the time the German military machine is materially weakened. To begin "Closing and tightening the ring round Germany" was a course of action obviously well adapted to this end. Throughout the conference the American Chiefs of Staff avoided debate on the soundness of the strategy of encirclement or of the proposed first step in carrying it out, the occupation of forth Africa. General Stilwell, who had just begun to study the Dakar operation, was reassigned to this operation. the Middle and Far East. Although there was no immediate prospect of an invasion of the British Isles, the British could dispatch reinforcements to the Middle and Far East--or undertake the occupation of French North Africa--during the first half of 1942 only by considerably increasing the risk of an invasion of the British Isles during the summer. On these grounds, the American planners not only appreciated but were inclined to emphasize the need for deploying U.S. Army forces in the North Atlantic. THE CHIEF OF STAFF AND THE SECRETARY OP WAR. 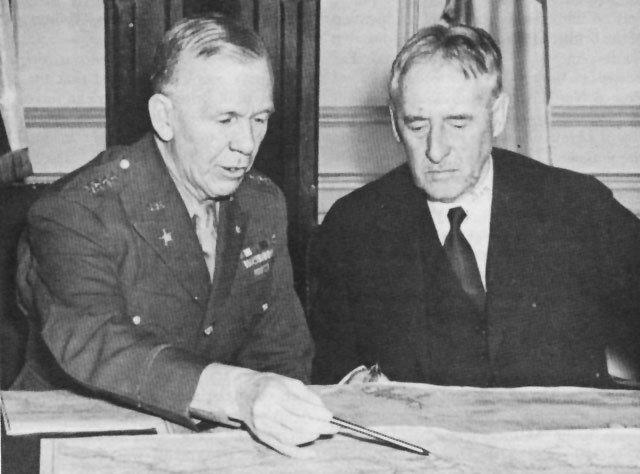 General Marshall conferring with Henry L. Stimson. some of them could he used for the movement of troops to Iceland and the British Isles. They thus had the occasion to point out to the President and the Prime Minister that if the North African operation were undertaken, the relief of British troops in Ireland and Iceland would have to be postponed. John Dill had said at the fiat meeting of the Chiefs of Staff, in answer to a direct question from General Marshall, that the North African project would take precedence over the relief of the British garrisons, but the planners needed a clear declaration of policy.46 How necessary it was, became evident on the afternoon of 26 December when the Chiefs of Staff and the senior planners met with the President and the Prime Minister to consider the problem. While waiting for information on the Fijis and New Caledonia, the War Department was rapidly drafting orders for shipments to the "island bases" in the South Pacific that were the Army's responsibility.65 the projected garrisons were 2,000 for Christmas Island and 1,000 for Canton Island.66 In the next lower priority came a force of about 4,000 troops, requested by the Navy to garrison a refueling station on Borabora on the convoy route to Australia.67 The orders called for only small Army contingents at these bases, on the assumption, clearly expressed by Marshall, that the Navy ,would relieve the Army garrisons in case of heavy attack.68 In addition, the Army undertook to send a pursuit group (700 men) to Suva to supplement the New Zealand garrison. The Navy at the same time went ahead with its preparations to garrison Palmyra and American Samoa. 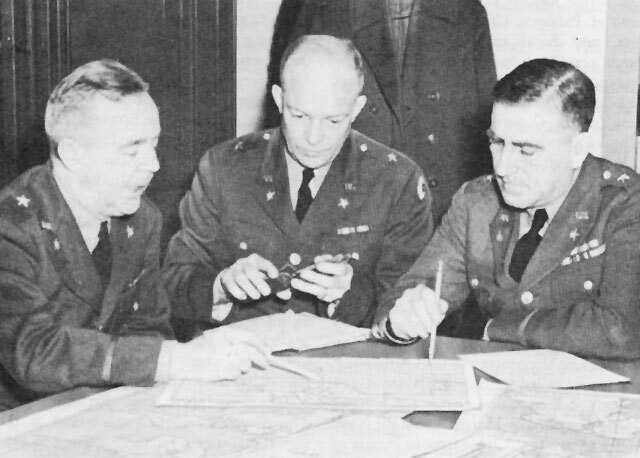 CHIEF OF WAR PLANS DIVISION AND HIS DEPUTIES, January 1942. Left to right: Brig. Gen. Robert W. Crawford; Brig. Gen. Dwight D. Eisenhower; and Brig. Gen. Leonard T. Gerow, Chief. island.71 In anticipation of a decision to send additional U.S. reinforcements to the Pacific, the War Department staff organized a task force of about 16,000 troops (a heavily reinforced infantry brigade, about 10,000 men plus supporting service units; , under Brig. Gen. Alexander M. Patch, with a view to their possible employment as a garrison for New Caledonia.72 Together with this force, the staff also planned to send about 5,000 additional troops for Australia, including air replacements and engineer units urgently requested by General Brett. This convoy brought to about 37,000 the number of Army troops that the American planners were preparing to send at once to the Southwest Pacific, with 10,000 more to follow. There was a simple reason why cargo chipping at this point replaced troop shipping as the critical factor. It required far more tonnage to establish forces in a new and largely undeveloped area directly in the path of the main Japanese offensive than to supply the same number of troops sent as reinforcements to areas better developed and less immediately threatened. Once the greater part of American troop shipping was diverted to the garrisoning of the island bases in the South Pacific, the development and local defense of the Australian air base, and the development of air operation: north of Australia, the ratio of tonnage to troops greatly increased. General Eisenhower commented, "Somervell (G-4) did a good job finding boats. We'll get off 21,000 men . . . to Australia; but I don't know when we can get all their equip. and supply to them. Ships! Ships! "80 All we need is ships!" The great New York convoy that was to leave for the Southwest Pacific was only a part of what was rapidly becoming a major movement of American and British troops for the purpose of containing the Japanese advance. The projected American shipments, besides the 21,000 troops in the Mew York convoy to the Southwest Pacific, then included the garrisons for the island bases (nearly 8,000) and three convoys from the west coast to Australia--the first (7,000 troops) ready to sail, the second (14,000 troops) to sail at the end of the month, the third (11,000 troops) to sail some time in February.81 The initial shipments required to house and feed these force, to provide them with guns and ammunition. planes, fuel, and engineer equipment would amount to well over a half-million tons of cargo (over and above what they could obtain locally). The President then stated that if the Germans should move into the Gymnast area in the interim, the thing to do would be to utilize whatever forces were available. The American planners could scarcely doubt that once the Japanese offensive was contained, if not before, the North African operation would again become the first question of American-British strategy. 2. Msg from Br CsofS aboard HMS Duke of York, 18 Dec 41, Item 5, Exec 10. This is the original WD copy. 3. For an account of these preparations, see Cline, Washington Command Post, pp. 87-89. 4. (1) Notes, G.C.M. [Marshall], 23 Dec 41, sub: dotes on Mtg at White House with President and Br Prime Minister Presiding, WPD 4402-136. (2) Votes on Informal Confs Held During Visit of Br CsofS in Washington, WDCSA 334 Mtgs and Confs (1-28-42 (1-28-42). (3) Min, conf at White House, 12 Jan 42, sub: SUPER-GYMNAST. GYMNAST and SUPER-GYMNAST Development File, G-3 Regd Docs. War Department files include records of various other meetings in which the President and the Prime Minister, separately or together, discussed military matters with members of the military staffs. Notes on Informal Conferences (cited above) include minutes of two meetings at the White House attended by the members of the American military staff. 5. See note for rcd, Gen Gerow, 21 Dec 41, Tab Collab, Book I, Exec 8. 6. "Proceedings of the American-British Joint Chiefs of Staff Conferences Held in Washington, D. C., on Twelve Occasions between December 24, 1941 and January 14, 1942," filed with ABC 337 ARCADIA (24 Dec 41), 1. Note that the term "Joint" was still being used to denote international as well as interservice deliberations; the fixed distinction between "Joint" and "Combined" was recommended and adopted at the conference. 7. Min, ARCADIA mtgs, ABC 337 ARCADIA (24 Dec 41), 1. 8. Min, Jt [British -American] Plng Corn Mtgs, Tab 3, ABC 337 ARCADIA (24 Dec 41), 2. 9. WPD paper, 21 Dec 41, sub: Notes on Agenda Proposed by Br, Folder Book 2, Exec 4. This compilation included two versions of the American view of grand strategy. The latter, fuller version is contained in the first paragraph of the second section of the first study, entitled: General Strategic Review. This was prepared in WPD after consultation with Navy and Army Air planners. The earlier, shorter version is in a "tentative first draft" prepared in WPD and sent to General Marshall and Secretary Stimson on 19 December. 10. The statement of the British Chiefs in August 1941 at the Atlantic Conference is quoted and discussed above, pp. 55 ff. 11. Churchill, Grand Alliance, pp. 657-58, The passages quoted are from Part III, "The Campaign of 1943," dated 18 December 1941, of the Prime Minister's presentation to the President of his theory of strategy. 12. Churchill, Grand Alliance, p. 659. See Churchill's notes of a meeting of 18 December with the British Chiefs, at which he read and they discussed the paper on the campaign of 1943. 13. Memo, Br CsofS (for Amer CsofS), 22 Dec 41, sub: Amer-Br Strategy, ABC 337 ARCADIA (24 Dec 41), 2. This is the first version of WW-1, the first paper presented at the ARCADIA Conference. WW-1 (standing for War Conference) was the British code for ARCADIA papers. The American code was ABC-4 (carried over from earlier American-British conversations of early 1941, beginning with ABC-1). The American code for WW-1, as revised and finally approved, was ABC-4/CS-1. 14. Memo, Col Bundy for CofS (through ACofS, WPD), 24 Oct 41, sub: Trip with Harriman Miss, WPD 4557-12. For the Harriman mission, see Sherwood, Roosevelt and Hopkins, pp. 385-95. 15. WPD study, n.d., title: Est, Army Reqmts, a supporting study to JB 355, ser 707, 11 Sep 41, title: JB Est of U.S. Over-all Pdn Reqmts, Sec II, Part II, App II, pp. 2, 3, copy in WPD 4494-13. 16. Study, title: Gen Strategic Review, in Votes on Agenda Proposed by Br, 21 Dec 41, p. 9, Tab i, Folder Book 2, Exec 4. 17. Study, title: Immediate Mil Measures, in Notes on Agenda Proposed by Br, 21 Dec 41, pp. 5, 8, Tab ii, Folder Book 2, Exec 4. 18. See letters written to Admiral Pound and General Jan Christian Smuts while en route, in Churchill, Grand Alliance, pp. 632-33. 19. Votes, G.C.M. [Marshall], 23 Dec 41, sub: Notes on Mtg at White House with President and Br Prime Minister Presiding, WPD 4402-136. Compare the full account of the Prime Minister's views written for the President, in Churchill, Grand Alliance, pp. 648-49. 20. JB 3,55, ser 707, 11 Sep 41, title cited n. 15, p. 14. 21. Ltr, JPC: to JB, 25 Sep 41, sub: Gen Strategy--Review by Br CsofS, JB 325, ser 729. This statement of American views was superseded by the paper, cited in n. 9, entitled: Tentative U.S. Views on Sub of Br Memo, Dec 18. 22. The plan for Dakar being developed before Pearl Harbor bore the coda name BLACK. The code name BLACK was dropped, apparently because the Navy thought it indicated Africa by association of ideas, and the plan was briefly called PICADOR and, finally, BARRISTER. (See draft papers in BLACK arid BARRISTER Development File, G-3 Regd Docs. 23. Notes, SW, sub: Memo of Decisions at White House, Sunday, Dec. 21, 1941, WDCSA 381 (12-21-41) (SS). 24. WPD note for rcd, 21 Dec 41, Tab Collab, Book 1, Exec 8. 25. See passage quoted above, p. 18, from study cited n. 17. 26. Memo, Ridgway for Marshall, 23 Dec 41, no sub, Tab Misc, Book 1, Exec 8. 27. Notes cited n. 23. 28. (1) Memo, WPD for CofS, 14 Jul 41, sub: Suggested Amer Action in Af, WPD 4511-2. (2) WPD study, title: Lines of Action Open for Employment U.S. Trs, Tab IV in Vol, "Study on Occupation of Northwest Africa," WPD 4510. (3) Memo, Col Bundy for CofS, 28 Nov 41, sub: Conf with Mr. Bullitt, WPD 4511-26. 29. Memo, Gen Embick, no addressee, n.d., sub: Notes on Est of Br CsofS, in folder filed with Item 13, Exec 4. 31. Notes, G.C.M. [Marshall], 23 Dec 41, sub: Notes on Mtg at White House with President and Br Prime Minister Presiding, WPD 4402-136. 32. The compromise plan was circulated as Annex 2 to min, CsofS Conf, 26 Dec 41, ABC: 337 ARCADIA (24 Dec 41), 1. It bore the title: Project GYMNAST, and the code U.S. Serial ABC-4/2. For drafts, see ABC; 337 ARCADIA (24 Dec 411), 2. The original American and British estimates appear in a typescript entitled: Initial or Three Months force, filed in envelope with Item 13, Exec 4. 33. (1) Typescript cited n. 32. (2) WPD study, n.d., title: Data on Assistance Which Can Be Furnished Br in Occupation of NW Af. (3) Paper, n.d., title: Gen Disposition of Proposed Trs for Def NW Af. Last two filed in folder with Item 13, Exec 4. 34. WPD study, n.d, title: Basis of WPD Est of Forces Req to Hold Morocco, Algeria and Tunisia, filed in folder with Item 13, Exec 4. 36. Plng paper, sub: Project- GYMNAST, Annex 2 with min, CsofS Conf, 26 Dec 41, ABC 337 ARCADIA (24 Dec 41), 1. GYMNAST was a code word assigned by the British to their North African plan. See Churchill, Grand Alliance, p. 632. 37. (1) For a thorough post-Pearl Harbor survey of the shortage of troopships, see memo, G-9 for CofS 11 Dec 41, sub: Shipping Sit, Tab 115 in Day File 1941, OCT HB. (2) Memo, Brig Gen Brehon B. Somervell for Gen Moore, 21 Dec 41, no sub, incl memo, Col Charles P. Gross for Gen Somervell, 21 Dec 41, sub: Est of Shipping Available for U.S. Overseas Efforts 1942 and 1943, Item 14, Exec 4. 38. Min, 1st mtg Jt Plng Com, 24 Dec 41, ABC 337 ARCADIA (24 Dec 41), 2. 39. Memo, Gen Somervell, Capt Edmund W. Burrough [USN], Capt Charles S. Alden [USN], and Marshal L. Wilcox [Asst Dir of Emergency Shipping, U.S. Mar Comm] for Jt Plng Corn, 26 Dec 41, sub: U.S. Shipping Capacity to Carry Trs Overseas, with atchd note on Br shipping, signed John S. Maclay, of Br Merchant Shipping Miss, and atchd chart of U.S. tr shipping capacity, in envelope with Item 13, Exec 4. 40. Rpt, Jt Plng Com, 25 Dec 41, title: Priorities for U.S. and U.K. Overseas Expeditions in Atlantic, ABC-4/1, filed with later drafts in ABC 337 ARCADIA (24 Dec 41) , 2. 41. (1) Notes, SW, sub: Memo of Decisions at White House, Sunday, Dec 21, 1941, WDCSA 381 (12-21-41) (SS). The President noted that a force of two divisions or more would go to Northern Ireland. (2) Notes, G.C.M. [Marshall], 23 Dec 41, sub: Notes on Mtg at White House . . . , WPD 4402-136. The initial ARCADIA decision, taken at this meeting, was to send three divisions to Northern Ireland. (3) Min, CsofS Conf, 24 Dec 41, ABC 337 ARCADIA (24 Dec 41), 1. Field Marshal Sir John Dill remarked that he understood the Northern Ireland force was to consist of three infantry divisions plus one armored division, and General Marshall agreed. 42. (1) Conf in OCofS, 0830, 26 Dec 41, WDCSA 334 Mtgs and Confs (1 28-42) (SS). (2) Memo for rcd, 26 Dec 41, sub: Mtg Held in OCofS, WPD 4497-22. Originally the 3d Armored Division was to be sent, but the 1st Armored was substituted a few days later. See memo, GHQ for WPD, 31 Dec 41, sub: Changes in Tr Designations, and note for rcd, Gen Gerow, 1 Jan 42, sub: Decisions of CofS, both in WPD 4497-23. 44. See notes and min cited n. 41. 45. Notes cited n. 41 (2) . 46. Min cited n. 41 (3). 47. Conf at White house, 1630, 26 Dec 41, WDCSA 334 Mtgs and Confs (1-28-42) (SS). 48. Min, 7th mtg CsofS Conf, 31 Dec 41, ABC 337 ARCADIA (24 Dec 41), 1. 49. (1) Memo, CofS, no addressee, 1 Jan 42, sub: Initial Atlantic Tr Movmt, WDCSA 381, 1 (SS). (2) Rcd, nag at White House, 1830, 1 Jan 42, WDCSA 334 Mtgs and Confs 1-28-42) (SS). 50. (1) Note for rcd Gen Gerow, 1 Jan 42 sub: Decisions of CofS, WPD 4497-23. (2) Memo, WPD for CofS, 6 Jan 42, sub: Comd Arrangements, USAFBI, WPD 4497-23. (3) Msg, WD to Sp Army Obsr, London, 8 Jan 42, No. 293, WPD 4497-23. (4) ABC-4/7, 11 Jan 42, title: Estab of U.S. Forces in N Ireland, ABC 337 ARCADIA (24 Dec 41), 1. 51. Min, CsofS Conf, 27 Dec 41, ABC 337 ARCADIA (24 Dec 41), 1. 52. Ibid. Cf. Stimson's remarks in April 1941, cited above, pp. 52-53. 53. Rpt, Jt Plng Com to CsofS, 27 Dec 41, title: NW Af Project [ABC-4/2], ABC 337 ARCADIA (24 Dec 41), 2. 54. Min, CsofS Conf, 31 Dec 41, ABC: 337 ARCADIA (24 Dec 41), 1. 55. (1) Conf in OSW, 1530, 4 Jan 42. (2) Conf in White House, 1730, 4 Jan 42. Both in WDCSA 334 Mtgs and Confs (1-28-42) (SS). 56. Memo, Admiral Turner for Admirals Stark and King, 4 Jan 42, sub: Status of Work Before CsofS and Jt Plng Com, with JCCSs 7 in ABC 337 ARCADIA (24 Dec 41), 2. 57. Confs cited n. 55. 58. Churchill, Grand Alliance, pp. 684-85. "Though few, if any, saw it in this light, this was in fact the first step towards an Allied descent on Morocco, Algeria, or Tunis, on which my hart was set. The President was quite conscious of this, and while we did not give precise form to the idea I felt that our thoughts flowed in the same direction, although it was not yet necessary for either of us to discuss the particular method." 59. Conf cited n. 55(2). SUPER-GYMNAST was the code name given at ARCADIA to a projected U.S.-British operation in North Africa that would combine the American plan of a landing at Casablanca with the British plan for a landing further eastward on the Mediterranean coast (GYMNAST). GYMNAST was often used loosely to refer to either operation. 60. Br plng paper, 10 Jan 42, title: SUPER-GYMNAST (WW (JPC) 2], ABC 337 ARCADIA (24 Dec 41), 2. 61. Rpt, Jt Plng Com to CsofS, 13 Jan 42, title: Opn SUPER-GYMNAST [ABC.-4/2A], ABC. 337 ARCADIA (24 Dec 41), 2. 62. (1) Notations by Eisenhower, 1 and 4 Jan 42 entries, Item 3, OPD Hist Unit File. (2) Notes on nag, War Council, 5 Jan 42, WDCSA, SW Confs, Vol II. 64. Min, 6th mtg Jt Plng Com, a Jan 42, ABC: 337 ARCADIA (24 Dec 41), 2. 65. Memo, WPD for CofS, 4 Jan 42, sub: Tr Mvmts to Pacific Bases, WPD 4571-22. 66. (1) Ibid. (2) D/F, WPD for GHQ, G-3, G 4, and AAF. 10 Jan 42, sub cited n. 65, WPD 4571-22. 67. (1) demo, SW for CofS, 1 Jan 42, no sub, WPD 4571-21. (2) Memo, WPD for G-4, 2 Jan 42, sub: Tr Mvmts to S Pacific Bases, WPD 4571-22. (3) Memo for rcd, Col L. S. Gerow, 3 Jan 42, WPD 4571-22. (4) Memo, WPD for CofS, 5 Jan 42, sub: Borabora Def Force, WPD 4571-24. 68. Notes on mtg, War Council, 5 Jan 42, WDCSA, SW Confs, Vol II. 70. Draft rpt, Jt Plng Corn to CsofS Com [8 Jan 42], title: Def of Pacific Islands Route, ABC 337 ARCADIA (24 Dec 41) , 2. This was a second revision, circulated by the British members. 71. Memo, WPD for TAG, 22 Jan 42, sub: Def of New Caledonia WPD 3718-17. 72. (1) Unused memo, WPD for CofS, 12 Jan 42, sub: Dispatch of Add Forces to Australia, WPD 4630-39, and memo for rcd, Col L. S. Gerow, written thereon. (2) Memo, Brig Gen Robert W. Crawford for Gen Gerow, 12 Jan 42, sub: Tr Mvmt to "X," WPD 4630-39. 73. Min, CsofS Conf, 11 Jan 42, ABC 337 ARCADIA (24 Dec 41), 1. 74. (1) Min, CsofS Conf, 12 Jan 42, ABC 337 ARCADIA (24 Dec 41) , 1. (2) Min, conf at white House, 12 Jan 42, sub: SUPER-GYMNAST. GYMNAST and SUPER-GYMNAST Development File, G-3 Regd Docs. 75. The schedules provided for dispatching to Northern Ireland 7,000 troops by 1 February on the Queen Mary; 9,000 troops 15-20 February on three British transports; and 4,400 troops by 24 February on the George Washington. 76. Min cited n. 74 (2). 79. Rpt, Jt Plng Com to CsofS, 13 Jan 42, title: Opn SUPER-GYMNAST [ABC-4/2A], ABC 337 ARCADIA (24 Dec 41), 1. 80. Notations by Eisenhower, 12 Jan 42 entry, Item 3, OPD Hist Unit File. 81. For the west coast convoys to the Southwest Pacific, see Marshall's statement in minutes cited n. 74(2). Total projected strength for the Southwest Pacific (including 4,500 troops already in Australia) was then about 59,000 troops. 82. Min cited n. 74 (1). 83. Min cited n. 74 (2). 84. Conf at White House, 1730, 14 Jan 42, WDCSA 334 Mtgs and Confs (1-28-42), (SS).